Although listed at a higher price point, these plug-in pest repellents are easy to use. Users can plug them in and walk away with confidence that the ultrasonic waves will keep away bats and other pests. 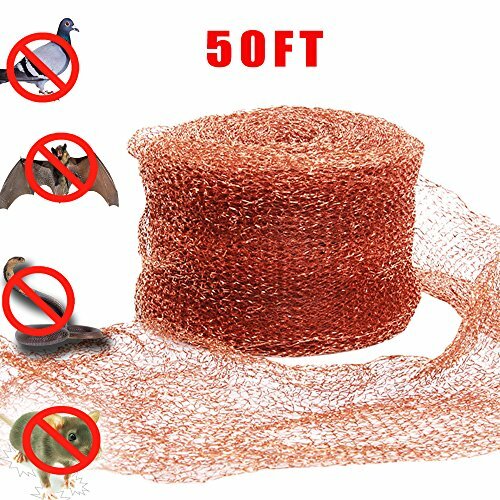 The copper mesh is excellent to fill holes and gaps that allow bats and other creatures to enter your home. Soft and easy to use, this mesh will last and repel a variety of pests. Unlike some metal and sharp spikes, these plastic bird spikes are designed to repel pests without harming them. Additionally, the spikes discourage entrance from predators. Bats are commonly known to make their way into homes, sheds, barns, etc. and creating a home for themselves. Some bats will even create a colony within these places. Your attic can quickly become infested, and that’s not good. Although mostly known to be annoying, there are several dangerous downfalls to having a bat problem. From disease and uncleanliness to disruptions in utilities and your home’s structure, there are many reasons to get this issue under control as soon as possible. Luckily, several repellents and deterrents can help you get rid of bats and keep them away. We’ve reviewed some of the best products for bat control. Why are bats a bad problem to have? What are some things I can do to help keep bats away? How do ultrasonic pest repellents work? 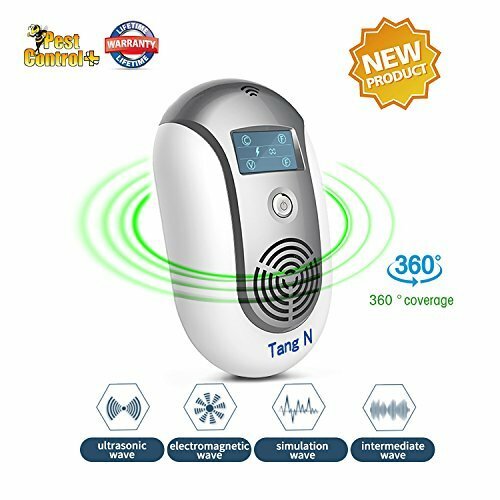 The TangN Ultrasonic Electromagnetic Pest Repellent device is an easy-to-use piece of equipment; all you need to do is plug it into an outlet and press the power button, and it’s ready to go. This intelligent device utilizes a control chip that will automatically provide a smart band of frequency. This frequency will remain at a level that deters rodents like bats while remaining safe for infants, children, pets, pregnant women, and everyone in your home. The dual-wave component in this device can penetrate walls and has a 360 view. It uses both ultrasonic and electromagnetic waves. These features allow it to work all the time, anywhere, and covering all your basis. With 18 different types of pulse sound waves, customers can be assured that this product will not only free your home from bats but from any other pest or rodent that enters by stimulating the auditory system. The irritating frequencies and waves will confuse and deter bats from the area. One of the best ways to stop bats from entering your home is to cover up those holes and cracks found on your walls, rooftops, etc. Haierc Copper Mesh is designed to cut to any size. Its soft texture makes it safe to handle without gloves or special instructions. The mesh simply needs to be cut to size and stuffed in any cracks, crevices, or holes that bats and pests are entering your home through. Completely environmentally safe, the specially treated copper will never rust or leave unsightly stains. The design can repel bats, but it will also repel birds, mice, snails, slugs, insects, and other critters. The special treatment prevents pests from biting at it. 100% nonflammable, there is no cause for concern when using this product. Additionally, this product can be used in place of steel wool to clean in a more environmentally safe way. It can also be used in tandem with sealants for extra security in holes and cracks. The Abco Tech Bird Spikes are a great investment for anyone who wants to prevent bats and other pests from intruding without actually hurting them. These flexible rows of polypropylene spikes discourage bats and other animals like cats, dogs, birds, mice, etc. from landing on or climbing on walls, rooftops, fences, and other locations. The simple design won’t affect your property’s appearance; they are discrete, yet effective. In fact, these spikes can even discourage human intruders from climbing walls and fences to get into your yard. The spikes are enough to cause discomfort or slight pain, but not enough to injure a human or an animal. With easy installation, the spikes will deter bats from landing on your roof and finding places to get into your home. If there’s nowhere to land, they will move on elsewhere. 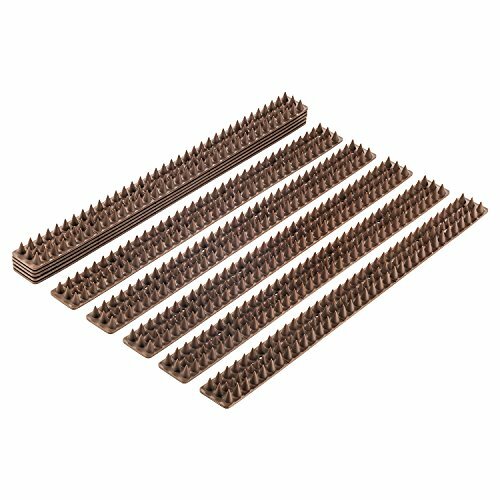 An affordable solution, the bird spikes are easy to install and come in a pack of ten for full perimeter control. Their weather-resistant design will have them working for years to come after one single installation. 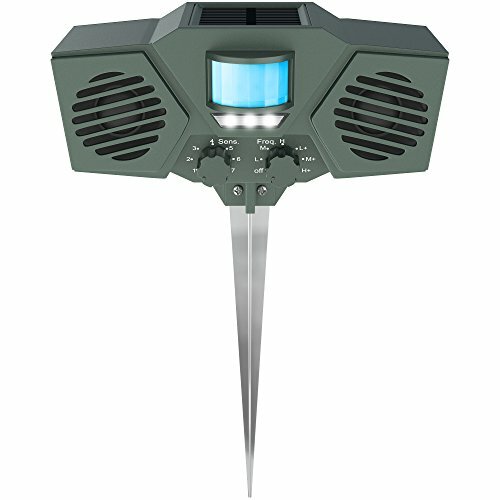 The Hoont Solar Ultrasonic Outdoor Animal Repellent is a great option for repelling bats. It uses powerful ultrasonic sounds paired with bright, flashing LED lights. The combination of these two items provides an aggressive attack and defense against bats and other animal intruders. Using an infrared motion sensor, the repeller detects when pests are roaming on your property. When it detects something, it is activated and sends off its harmless attack. The intelligent device is equipped with seven sensitivity settings as well as three ultrasonic frequency settings. The LED flashing light is optional, so if it bothers you or your neighbors, it can be shut off. Since this device is solar powered, there are no wires, batteries, or complicated installation required. It includes three rechargeable batteries that harness the sun’s energy. The Hoont animal repellent is weatherproof as well as water-resistant, giving you confidence that it will last through all seasons without issue. It is ideal for any yard, any weather situation, and a variety of settings including gardens, farms, porches, garages, etc. We have provided you with some of the best repellents and deterrents for bats in the business, and now we would like to equip you with knowledge as well. Read on to learn the answers to some commonly asked questions concerning bats and the various ways to rid your property of them. While most bats will rarely directly interfere or interact with humans, they can still cause several issues in your home. Bats seeking a home or shelter can find their way into your homes, usually through roof edges, vents, or any other small holes or crevice. Certain kinds of bats referred to as colonial or social bats, can form colonies. These colonies damage your home, creating nests and holes in attics and walls. Additionally, bats have been known to make their homes in sewers, utility sheds, and water wells where they interfere proper functioning of utilities. Aside from the obstruction of utilities, bats can cause other health concerns. For one, they leave their droppings where ever they are staying. Their droppings, called guano, foster environments for microbes and bacteria that can cause disease. These creatures often act as annoyances, too. Their constant rustling and chirping can be irritating. On top of all of this, who knows if the bats living in your attic are infested with rabies or another disease? Try to catch damage before it gets too bad. Use sealants to cover any cracks that start to form in your home. Bats love to find their way into your home through tiny cracks, crevices, and holes. One of the best things you can do to keep bats (as well as other critters) out of your home is to keep up with regular maintenance. Try to catch damage before it gets too bad. Use sealants to cover any cracks that start to form in your home. If there is no way to get into the house, you could very well prevent your bat problem before it starts. Some do-it-yourselfers like to use mylar balloons and aluminum foil to keep bats away. Both of these objects tend to be shiny and reflective. Hanging them around the bats’ nest will scare them and keep them from coming back. Additionally, the noise that aluminum foil makes when you touch it will actually cause the bats pain. You can use several kinds of light or sound to deter bats. Their sensitive eyes and hearing are easy to disturb. Some people like to hang mirrors around the nests, like in their attic. The reflective nature of the mirror confuses and shocks the bats. Ultrasonic pest controllers, like the two we mentioned above, are electronic devices designed to keep various pest and rodents away from your homes. They work by emitting high-frequency sounds that disrupt and annoying pests. The purpose of these sounds—which can’t be detected by human ears—is to cause a phenomenon referred to as an audiogenic seizure response. This response causes massive confusion, convulsions, non-directional running, and possibly even death. Since this response is clearly very unpleasant, the goal is that small animals that come within range of it will try to get away from it as soon as possible. Ultrasonic pest repellents are popular because they are extremely easy to use. While bigger, stronger versions exist, there are smaller, in-home devices that only need to be plugged into an outlet to work. Users commonly place these in kitchens, laundry rooms, attic, bedrooms, etc. They can be placed anywhere because they won’t disturb those who live in the house.